It was my fifth season at North Slope Farm when we undertook “the great fruit/nut planting of 2010”. After digging 125 holes and getting these plants settled in, it was already time to jump in to the main vegetable production season. The season was flying by and the time we could put towards this new undertaking (perennials) was just bare minimum. We had numerous casualties by the end of the season. The following spring of April 2011, when replacing dead trees, we utilized the same varieties. Time spent caring for our fruit and nut bearing “friends” did increase slightly but not nearly enough. Our trees were just surviving when they could and should be thriving. In 2011, much of my time was spent outside of our primary production areas working to re-establish our perennial herbs in the “Corner Garden”. It made sense for me to increase my responsibilities to include all perennials. Protection from larger predators in the form of fencing and trunk guards (for trees). These goals were part of a one year management plan which incorporates what I consider to be most “basic needs” for all perennial plantings. Overall, it was a successful year. Our Lemon Verbena crop was excellent, with a yield of 7.6 pounds of dried herb tea per 120 square foot bed. We saw our first peaches ripen and all “basic needs” were met. As a result the survival rate of our trees increased from just over 50 % in 2010 to over 90% in 2012. Among this seasons challenges was the “unhappy cherries” (less than half survived). We also saw severe disease and pest damage in our oldest apple trees along with a harsh spring frost which resulted in our lowest yield in years for apples. Deer pressure continues to be a threat in the form of trunk rubbing and terminal bud nibbling. The “market garden” is protected by an electric fence which had been destroyed on the entire north side. We spent a day repairing the electric fence and we were also able to erect a deer fence around the “fruit cluster” in early winter. Yeah! The long term management strategy will build onto the “basic needs” plan as we learn more about the specific varieties we grow. We will become more familiar with specific fungal, bacterial and pest challenges here at North Slope Farm. We also hope to foster the growth of healthy plants by promoting diverse and abundant soil microbiology and by increasing overall diversity on the farm. Application of the “Four Holistic Sprays of Spring” (see Michael Phillips book The Holistic Orchard or go to www.groworganicapples.com). To utilize compost extracts and fermented herb teas to promote plant health (The Compost Tea Brewing Manual, Fifth Edition by Elaine R. Ingham, Soil Foodweb Incorporated at www.nofanj.org/literatureretrieve.aspx?ID=104151.) . Establish and map soil sampling sites for future reference. Establish beneficial plants in and under drip line of fruit and nut trees. Take soil samples and send for analysis. Track degree days to help monitor specific pest and disease pressures. Tracking exact dates of: (1) bud break (2) week of quarter inch green (3) early pink (4) bloom (5) petal fall and (6) first cover to help with the timing of any holistic spray applications. A final component of the long term plan is to double the herb production and sales each season until we reach $10,000/year. This will require identifying more production space, increasing herb seedling sales and upgrading our tea drying process. As more of our perennial fruits and nuts come into their prime production years, our goal is to gross $20,000 per acre. However, for the next few years the focus will be on boosting health and vigor by utilizing holistic orcharding techniques. 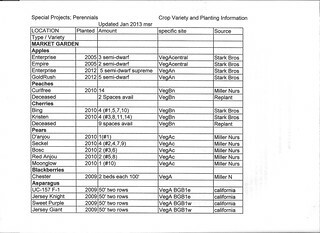 Click on image below to view varieties and planting details for the Perennials Project. Information about the project, including annual summaries, will be shared on our website under Special Projects; Perennials or a specific crop name.